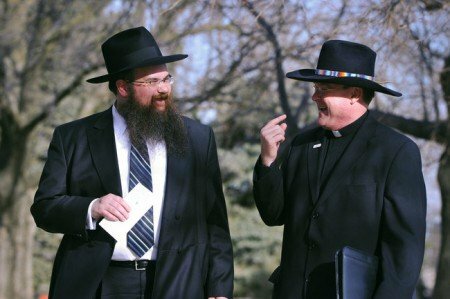 "Recovery Rabbi" Educates Staff at Boys Town On a clement winter day at the edge of the Nebraska Plains, two men in black trod a kind of hallowed ground. One was a Roman Catholic priest, the Rev. Steven E. Boes, and the other a Hasidic rabbi, Shais Taub. They were walking through Boys Town, Nebraska, a village founded decades earlier by an immigrant priest, the Rev. Edward J. Flanagan, for what were then known as “wayward boys.” Father Boes is now the executive director of Boys Town, and Rabbi Taub was a visitor with wisdom to share. For six years, Rabbi Taub, 37, has been teaching and writing about the spiritual component of recovery from addiction. He had begun within the Jewish community, specifically the Chabad movement, and yet providence or serendipity or destiny has brought him increasing recognition and influence well beyond it. So it was that Father Boes asked him to address a half-dozen staff members, some of them clergy and some of them therapists, who lead recovery programs at Boys Town. Once a refuge for children neglected or abandoned due primarily to poverty, it now deals extensively with boys and girls who have abused alcohol and drugs. And while Boys Town from its origin had been nondenominational and opposed to religious compulsion of any kind, it has always considered faith a central element for repairing damaged lives. Tying together the whole discourse was Rabbi Taub’s thesis, the central insight of his teaching and writing. Addiction, he argues, is less a chemical dependency or a mental illness than the consequence of an individual’s absence from God and of the psychic pain that absence inflicts. In saying overtly what the recovery movement often leaves deliberately ambiguous — the 12 Steps of Alcoholics Anonymous refer to a “Higher Power” without defining it — Rabbi Taub has become a phenomenon. Even as he is anchored within the Hasidic world, he has transcended it, first by reaching unaffiliated and secular Jews and then, most unexpectedly, by finding an eager audience among Christians. Rabbi Taub’s 2011 book, “God of Our Understanding: Jewish Spirituality and Recovery from Addiction,” has just gone into its 10th printing. He recently delivered the keynote address, “God and Recovery,” to a national conference on addiction treatment. He editsJewishRecovery.org, a Chabad Web site, and also writes regularly for The Huffington Post on topics like the death of Amy Winehouse, a pop singer who had struggled with drugs and alcohol. His avid followers include the pastor of an evangelical megachurch in Alabama and the chaplain who runs a skid-row mission in Atlantic City. It is all a long way from childhood in a conventionally observant Jewish household in Chicago, the son of as psychologist and a speech pathologist, and an even longer way from young adulthood in the Crown Heights section of Brooklyn, where Rabbi Taub received his rabbinic education and ordination. This unanticipated journey into the gentile world has required some very precise ground rules on Rabbi Taub’s part. Without any formal training in addiction treatment, Rabbi Taub entered the field experientially in 2006, leading a weekly group at a Chabad House in Milwaukee for Jewish men in recovery. Through the efforts he was struck by how many of the men had become observant in the course of getting clean and sober. He considered that turns of events no coincidence. In the next several years, as he began to conduct research into addiction treatment, Rabbi Taub made a surprising and affirming discovery. It was a 1961 letter from Carl Jung to Bill Wilson, one of the founders of Alcoholics Anonymous. In it, Jung, the legendary psychiatrist, directly recommended “union with God” as essential to recovery. When a National Public Radio reporter profiled Rabbi Taub in 2009, he mentioned, rather prematurely, that he was writing a book. With the sound bite in the public record, Rabbi Taub then had to make good on the promise, and “God of Our Understanding” is the result. Rooted in Judaic text and tradition — from the Torah to Hasidic folk tales — the book paradoxically has become the rabbi’s calling card in settings as unlikely as Boys Town. And whatever culture shock the rabbi embodied in his fedora and flowing beard, his lessons required no translation.